Different outcome — much, much different. And the Tigard High School girls basketball team is pretty darn happy about it. 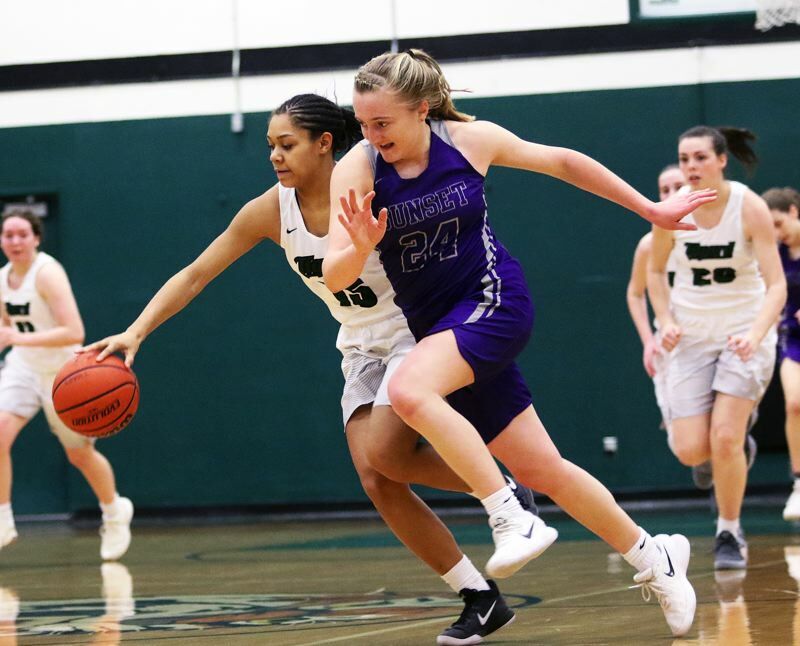 The Tigers, who saw their season end a year ago with a state playoff second-round home loss to Sunset, opened postseason play this year by running to a 59-29 win over the Apollos in a Class 6A state playoff first-round game played Tuesday at Tigard High School. And, while Sunset admittedly is a much different team than it was a year ago, last year's Tiger tears were replaced with big smiles this year. 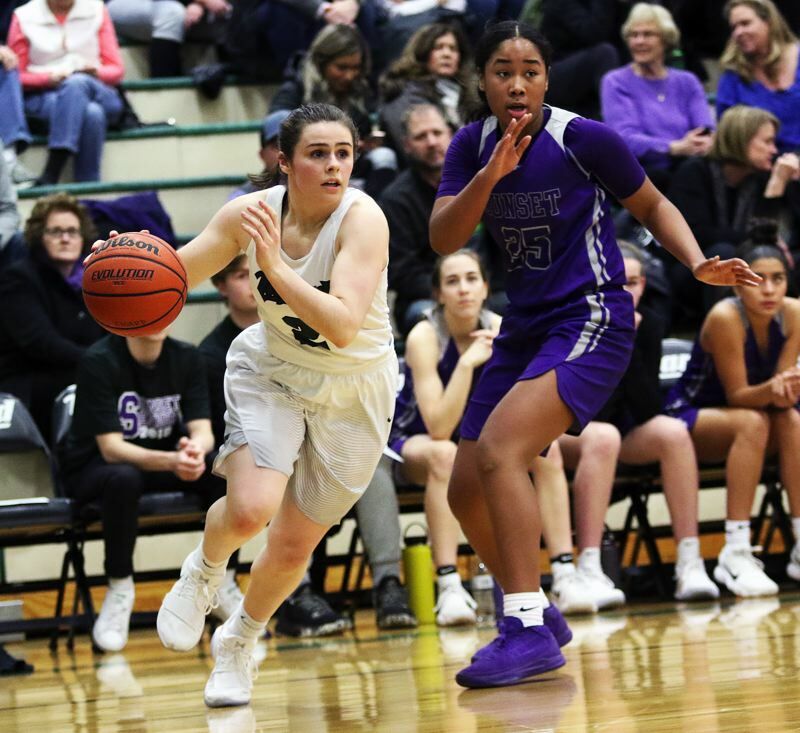 "For sure, this is a lot better than a year ago," said Tigard junior guard Campbell Gray, who led a balanced Tiger scoring attack in the victory with 11 points. 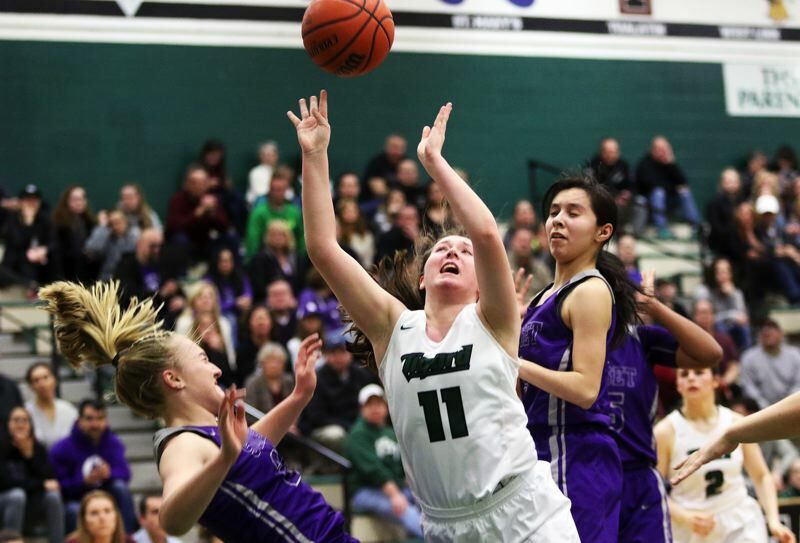 "I think we all kept that in the back of our minds," Tigard junior post Dani Lyons said. "We were ready to come out and win back our court." 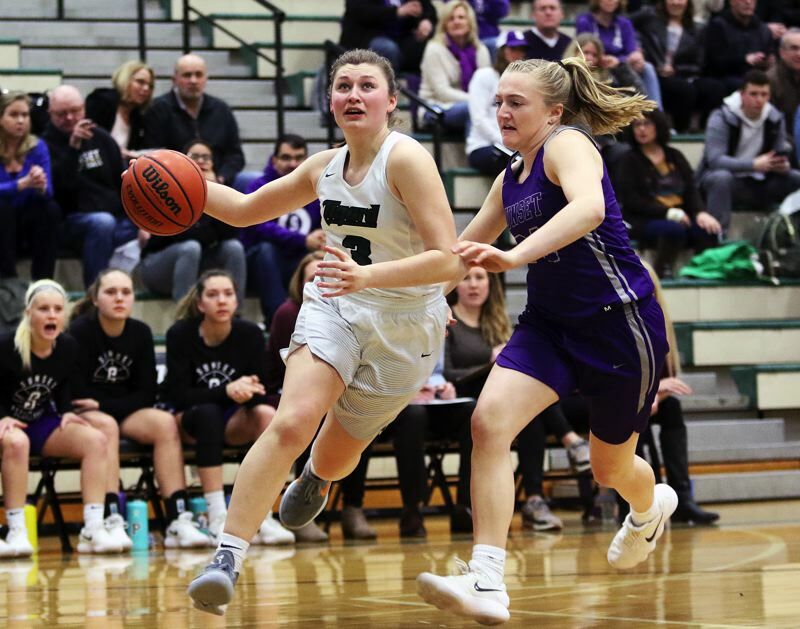 "(Tigard assistant) Coach (Jason Ashley) told us all season that the last time we lost at home was against Sunset in the playoffs last year," Tigard sophomore guard Kennedy Brown said. "So, we had to be ready." With the victory, Tigard, the Three Rivers League champion and the No. 2 team in the OSAA power rankings, improved to 22-3 on the season (11-0 at home) with the win. 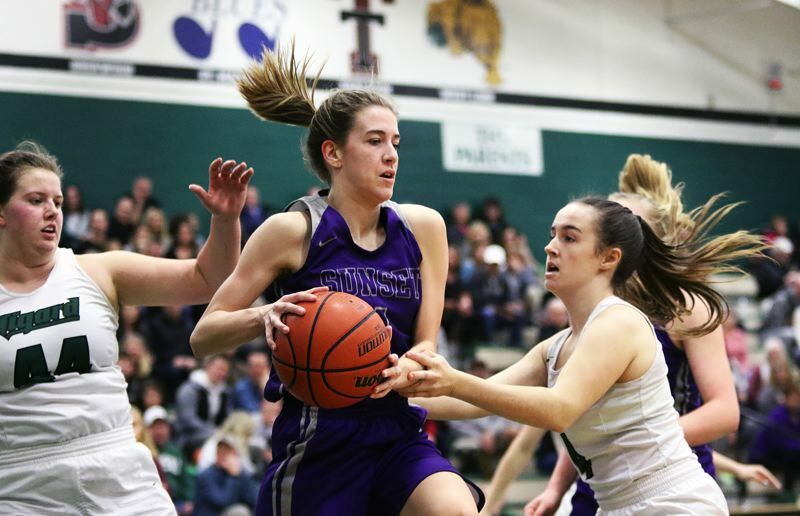 The Tigers also advance to host Grants Pass, a 51-39 playoff victor at Glencoe on Tuesday, in a Class 6A state playoff second-round game on Friday. "We still have some work to do, but we're excited," Gray said. Sunset, the No. 8 team out of the Metro League, finished its season with a final record of 8-17. 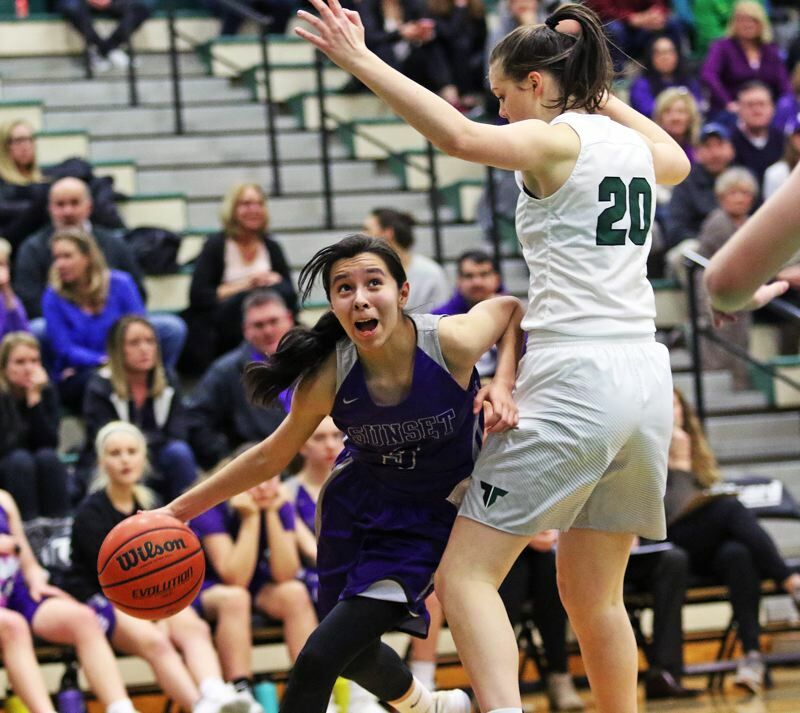 "We knew that we lost a lot of players from last year," said Sunset junior guard Vanessa Lopez, who led the Apollos with 11 points in Tuesday's playoff contest. "But, as we started to get to know each other, we really grew as a team." Tigard, in the playoff opener, took control from the start of the contest. The Tigers, with their pressing, swarming defense, forced Sunset into 10 turnovers in the first quarter. Tigard turned that defense into instant offense. Gray and Lyons each scored six points in the period, and senior Gabby McGaughey came off the bench to score four points, and pull down three rebounds, helping the Tigers sprint out to a 21-6 lead at the end of the first quarter. It was more of the same in the second quarter. 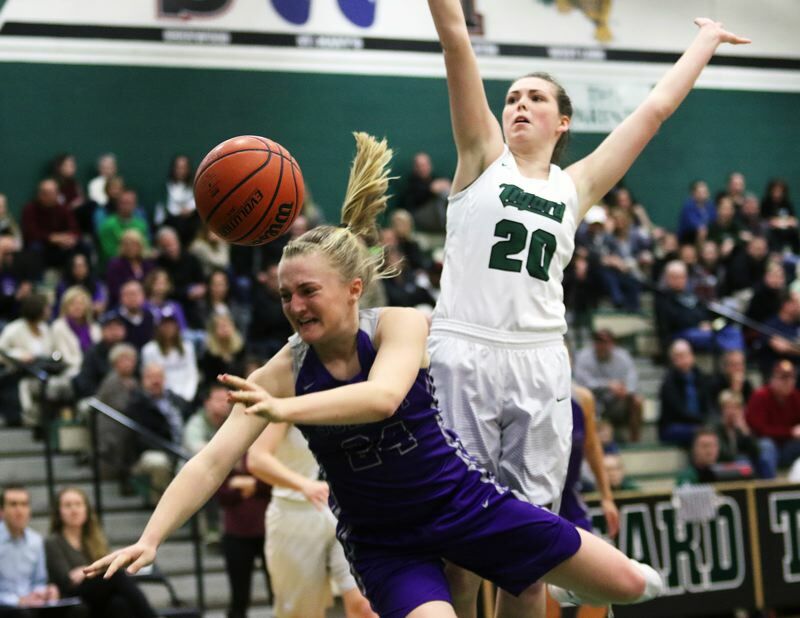 Tigard allowed Sunset to score just two points in the quarter, coming on a bank shot by Apollo sophomore Grace Kimball, coming with 4 minutes and 46 seconds remaining in the period. Meanwhile, Tigard got a pair of 3-pointers from sophomore guard Delaney Leavitt in the quarter. Brown also sank a 3-pointer and Gray had three steals and a pair of assists in the period, as the Tigers pushed their lead to 38-8 at halftime. 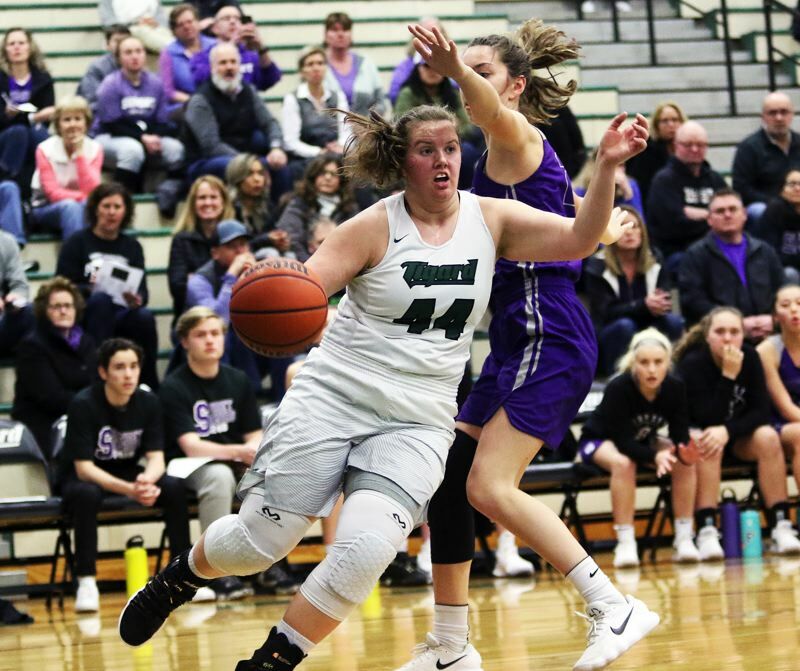 The third quarter saw Tigard take its biggest lead of the game, at 51-14, when Leavitt sank a 19-foot jumper with 16 seconds left in the period. Sunset, much to its credit, tried to battle back in the fourth quarter. Apollo senior Delaney Ragan scored five points in the period and Lopez sank a pair of 3-point baskets. 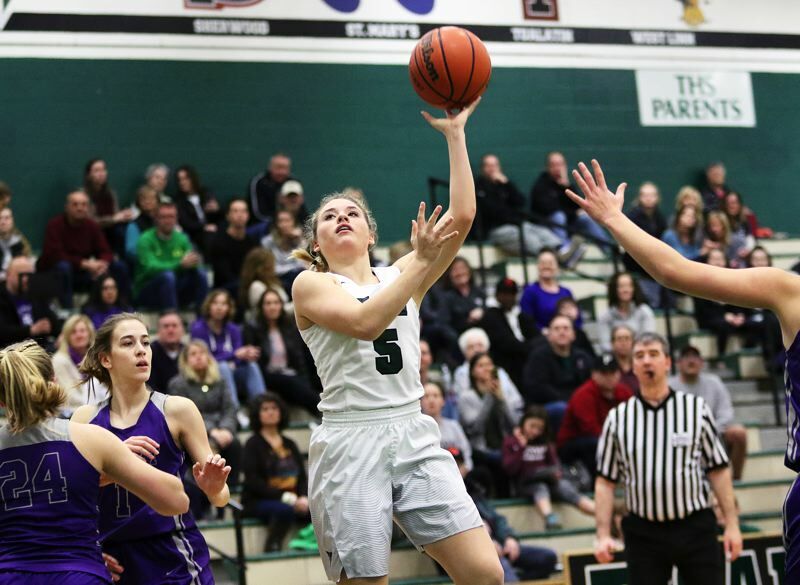 But Tigard, getting 3-pointers from senior Hannah Jedan and sophomore Lexi Klum in the fourth quarter, was able to close out the 59-29 victory. "We got it going early," Brown said. "We were intense on defense and composed on offense." "And we finished well," Gray added. Gray, in addition to her 11 points, also had six steals, four rebounds and four assists in the victory. Brown added 10 points, five steals and two assists. Lyons had eight points and four rebounds. Leavitt scored six points. McGaughey had six points, five rebounds and two steals. Junior guard Paige LaFountain had four points and four rebounds. 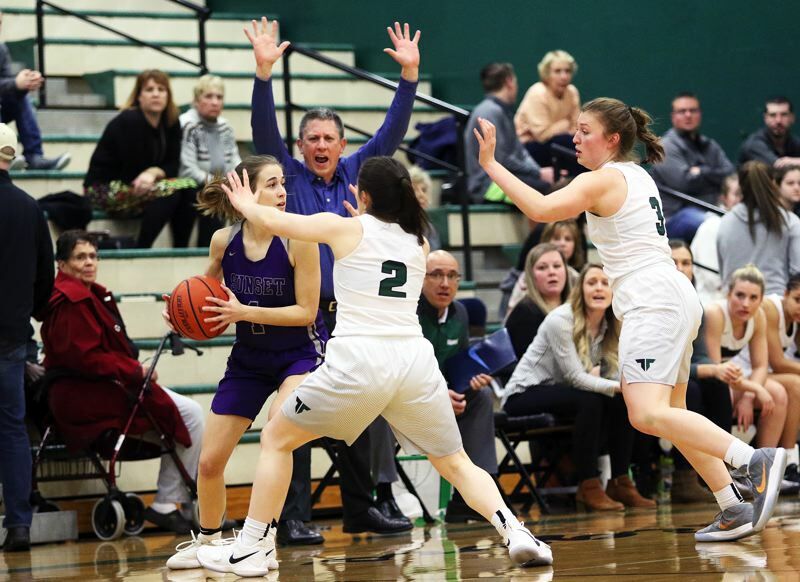 Tigard, as a team, made 22 of 51 shots from the field, with five 3-pointers, and 10 of 15 free-throw attempts. "That was a lot of fun," Lyons said. "This is my first full season, and I was excited to get out there." In addition to Lopez' 11 points, the Apollos also got seven points from Ragan and five points from Kimball. 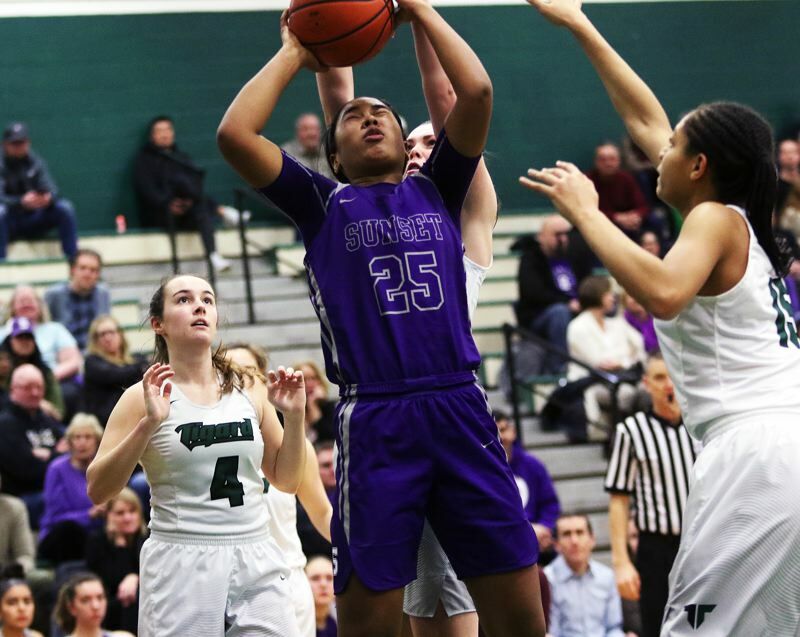 Sunset, as a team, made 10 of 33 shots from the field, with four 3-pointers, and five of six free-throw attempts. "We knew it could be the seniors' (Ragan and Kendsy Carmichael) last game, so we wanted to fight to the end," Lopez said. "I thought we brought a lot of energy in the second half." Grants Pass, the No. 4 team out of the Southwest Conference, and the No. 18 team in the OSAA power rankings, brings an overall record of 16-9 into Friday's playoff game at Tigard. "We need to keep playing hard," Brown said. 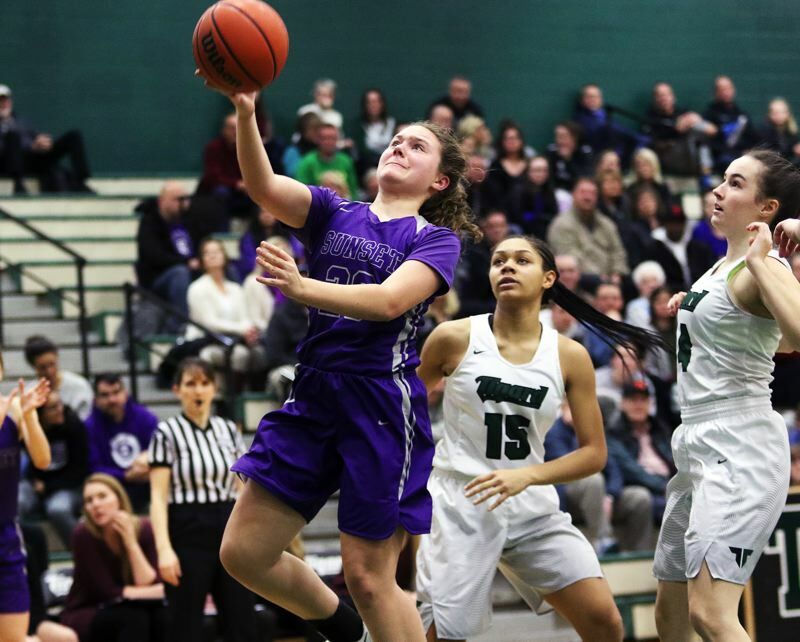 The winner of Friday's game at Tigard will advance to the Class 6A state tournament, which starts March 7 at the University of Portland's Chiles Center.